Byko: What was wrong in Al Capone's cell? 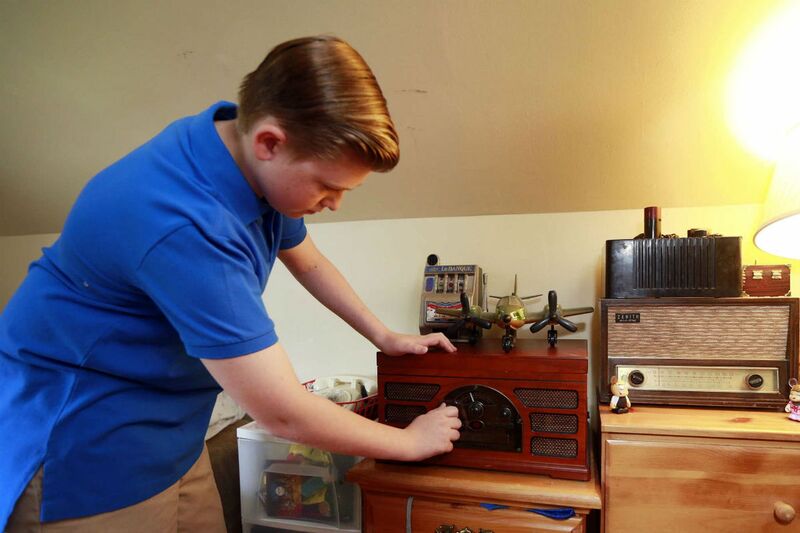 Joey Warchal, 13, is an antique expert from Somerton who has a vintage radio to make Al Capone's prison cell at Eastern State Penitentiary more authentic. AT A glance, Joey Warchal knew something was very wrong. He loved everything he saw during a tour of Eastern State Penitentiary - Al Capone's cell most of all, but something was very wrong. A tour guide said the Prohibition-era gangster was incarcerated in 1929 and 1930. "The radio featured in the display is historically inaccurate," Warchal politely emailed Eastern State Penitentiary senior vice president Sean Kelley after his tour. "As an antique collector specializing in radios," Warchal said "the radio displayed is a Philco A-361, made in January 1942," after Capone had departed Eastern State. It could not have been his radio. Warchal offered to help Kelley find an historically accurate radio for the display. Warchal is 13 and a seventh-grader at St. Christopher School in Somerton. Kelley was stunned and tickled by the letter and the sincere offer of help from the 13-year-old. I felt the same when I read the email correspondence. "Precocious" is too puny a word to describe Joey's self-confident, articulate presentation. "I am beyond excited to have received such an enthusiastic response! And to think, all of my friends doubted me!," wrote Joey, whose friends ought to know better. I'm greeted at the door of Joey's Somerton home by Clyde, a Boston terrier, Joey's pregnant mom Jennifer and his stepdad Vince, a Philadelphia police sergeant. There's not a blond hair out of place on Joey's head and his second-floor bedroom, the warehouse for his collection, is as well organized as a chess board. He has a dozen radios, five record players, about 1,000 45s in his room, as well as other pop collectibles. "Most kids want toys," his mom says. "He wants antiques." He started collecting when he was 8 and Jennifer worked in a bank. He began with foreign coins "and it just took off from there," he says. He got into radios and record players because "I liked the way they looked and the way they worked." Joey wasn't really keen about the cellphone his parents recently gave him for emergencies. "He didn't want it," says Jennifer. Joey did find a good use for the cell, though. "When I am out antiquing, I can research prices" on the spot, he says. He goes out whenever possible, usually weekends, when he can get a parent to take him. As photographer David Swanson moves around the room making images of Joey, I listen to the music playing - Clarence "Frogman" Henry, Clyde McPhatter, Little Richard. Am I in a time warp? "I like '50s rock 'n' roll," Joey says, pausing for effect before adding, "Rap is crap." I ask if that opinion buys him grief from his schoolmates. "I educate them," he says, helpful as a Boy Scout. "I bring my record player and educate them." In some schools, I'm thinking, that could get a kid pantsed. In his school, Joey was just elected class president for the 2016-17 school year, beating four other opponents, "making no promises I could not keep," Joey says seriously. He's on the swim team at St. Christopher's, which offers two honors classes - math and English. Joey is in both. He also likes to read books - both in paper form and online - mostly historical fiction and autobiographies. He does have some video games, to attest to his normalcy. Mrs. Peyton, who teaches honors English, is his favorite teacher and "helps me with my writing skills," Joey says. His other favorite teacher is Miss O'Connor, who teaches honors math. He likes school. "It's fun to see my friends," and "to prepare for the real world," says Joey, who hasn't chosen a career path, but could turn out to be a lawyer, dentist or mortician. "He's always been something else," says his mom, who is due to give birth in November to a daughter and Joey is looking forward to that. His older stepsister Kaitlynn is away at college. "He started saying words at four months and sentences at a year," says Jennifer, but he was her first child and she didn't know that was a big deal. Joey's IQ has not been tested and there are no plans to do that. "I don't want him to be treated any different," his mom says. Back here in the real world that Joey's schooling is preparing him for, Eastern State's Kelley allowed Joey to become the prison's agent, authorized to spend up to $400 for an historically authentic radio for Al Capone's cell. Joey reported to Kelley, "I have actually found a fine radio from late 1929, the Philco model '76' that I think would be very appropriate for the display. The radio is in very good condition, and believe it or not, it still works! The man selling wants 300 dollars for it, however I will offer him less." You will not be surprised to learn Joey was successful. "I would be happy to pick up and deliver the radio to ESP to save shipping charges," Joey wrote to Kelley, who accepted the offer and countered with one of his own: The radio will be received from Joey at an afternoon cider and cake ceremony Tuesday, June 7, at the penitentiary. And then, with the appropriate radio in Al Capone's cell, all will be right in Joey's very special world.